Welcome to our Boxing Day Brush Event! Save 65% off these incredible brush sets just in time for the new year! Release your inner makeup artist with Zoë Ayla’s new Professional makeup accessories line. This 4 piece brush set with soft-touch handles and beautifully colored natural laser cut microfiber bristles will help you achieve gorgeous looks and fulfill all your makeup needs. Very extensive and premium quality make up brush set that contains everything you’ll ever need. Made out of comfortable wooden handles with Grade A laser-cut microfibre bristles. Comes in an extremely useful pouch that makes it easy to keep all your brushes together as well as bring them anywhere. This set has been designed and tested by our professional team of makeup artists and was ergonomically designed to fit perfectly in your hands and ensure flawless application. Comes in a very handy leather pouch, perfect for travel. Hair materials: Synthetic Microfiber Grade A - Laser Cut Microfiber. Natural Wooden handles in black color. Collection of 32 most used brushes in the beauty industry. Designed and sampled in the USA by our team of Professional Makeup artists. Dimensions: 8" x 7" x 2". This set comes in an extremely useful pouch that makes it easy to keep all your brushes together as well as bring them anywhere. This set has been designed and tested by our professional team of makeup artists and was ergonomically designed to fit perfectly in your hands and ensure flawless application. Dimensions: 8" x 7" x 2"
Meet Zoë Ayla’s most MARBLEOUS makeup brush set with 7 brushes that come in a handy makeup case to keep your beautiful brushes organized and clean. Each brush has a unique marbleized design, which means yours will be unique to you! These brushes are made with comfortable handles with laser cut microfiber bristles. This set has been designed and tested by our professional team of makeup artists and was ergonomically designed to fit perfectly in your hands and ensure flawless application. This makeup brush set is a trending phenomenon with its increased bristle count and much more efficient and full-coverage application. It gently massages and exfoliates the skin at the same time making this a must-have accessory set for your collection. Each brush has a unique marbleized design, which means yours will be unique to you! The brushes are cruelty-free, vegan, soft and fluffy whilst being super effective with shed-free bristles. Meet Zoë Ayla's Trendy New 2 Piece Brush Set. In beautiful Black and White with Rose Gold accent, this set will be your go-to for all your foundation and powder needs. Made with comfortable handles and grade A laser cut microfiber bristles, these brushes are the perfect addition to your makeup routine. This set has been designed and tested by our professional team of makeup artists and has been ergonomically designed to fit perfectly in your hands and ensure flawless application. Meet Zoë Ayla's luxurious 10 piece makeup Brush set. 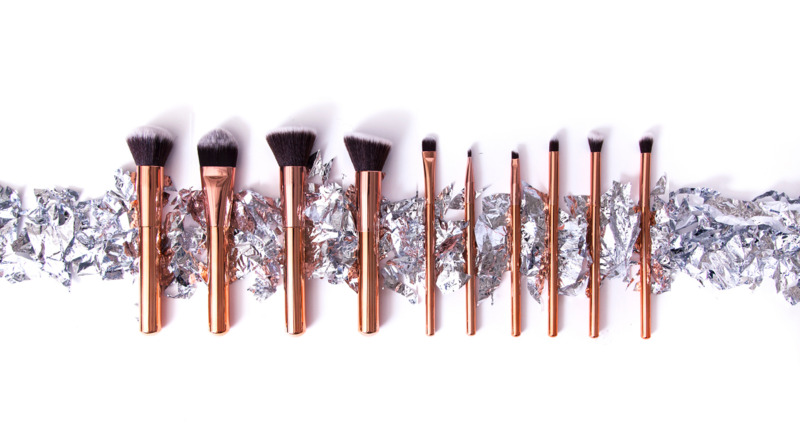 With its metallic rose gold look and it's soft bristles, this set will be the perfect gift for the Make-up lover. This perfect brush set contains everything you will ever need to do your makeup, from foundation to powder, to eyeshadow and even lip makeup. With this set, you will be ready to go in no time! Meet BLOOM by Zoë Ayla Premium Brush Set. A holographic premium brush set with unique chrome finish handles and ultra-soft bristles designed for all your blending and buffing needs. bristles designed for all your blending and buffing needs. Lovingly crafted with iridescent multi-dimensional futuristic handles and plush premium nylon bristles, this brush set features a tool for all your eye and base perfecting needs. Very extensive and premium quality make up brush set that contains everything you’ll ever need. This set has been designed and tested by our professional team of makeup artists and was ergonomically designed to fit perfectly in your hands and ensure flawless application. Premium quality makeup brush set with 3 most used brushes in the industry. These brushes are made with comfortable handles with laser cut microfiber bristles, and has been designed and tested by our professional team of makeup artists and were ergonomically designed to fit perfectly in your hands and ensure flawless application. This makeup brush set is a trending phenomenon with its increased bristle count and much more efficient and full-coverage application. It gently massages and exfoliates skin at the same time making this a must-have accessory set for your collection. Premium quality makeup brush set with 6 most used brushes in the industry. These brushes are made with comfortable handles with laser cut microfiber bristles, and has been designed and tested by our professional team of makeup artists and were ergonomically designed to fit perfectly in your hands and ensure flawless application. Meet BLOOM by Zoë Ayla Premium Brush Set. A magical premium brush set with unique clear unicorn handles and beautiful vibrant purple bristles designed for all your blending and buffing needs. Lovingly crafted with trendy unicorn inspired handles and plush premium nylon bristles, this brush set features a tool for all your eye and base perfecting needs. Very extensive and premium quality make up brush set that contains everything you’ll ever need. This set has been designed and tested by our professional team of makeup artists and was ergonomically designed to fit perfectly in your hands and ensure flawless application. Meet BLOOM by Zoë Ayla Premium Brush. A holographic premium brush with unique chrome finish handles and ultra-soft bristles designed for all your blending and buffing needs. Lovingly crafted with iridescent multi-dimensional futuristic handles and plush premium nylon bristles. This brush has been designed and tested by our professional team of makeup artists and was ergonomically designed to fit perfectly in your hands and ensure flawless application. A magical purple rainbow shell-shaped foundation brush with unique handles and beautiful bristles designed for all your foundation application needs. Lovingly crafted with delicate, shell-inspired handles and plush premium nylon bristles. This very extensive and premium quality make up brush has been designed and tested by our professional team of makeup artists and was ergonomically designed to fit perfectly in your hands and ensure flawless application. A magical shell-shaped foundation brush with unique handles and beautiful bristles designed for all your foundation application needs. Lovingly crafted with delicate, shell-inspired handles and plush premium nylon bristles. Very extensive and premium quality make up brush. This brush has been designed and tested by our professional team of makeup artists and was ergonomically designed to fit perfectly in your hands and ensure flawless application. I'm a huge fan of my Zoe Ayla Unicorn Brushes! The quality is absolutely amazing and they do a great job at applying powders and liquid makeup! I'm a full-time MUA & I can totally vouch for these professional brushes. I have literally used thousands of brushes in my career and the quality and price can't be beaten. I love my shell brush, it works great for foundation and it's absolutely gorgeous! First of all, I LOVE Zoe Ayla products! I recently picked up the 6 piece scepter set and I'm in love! The quality is incredible and it has everything I need in a brush set - I would definitely buy it again! These holographic brushes are SO nice! The bristles are super soft and they do a great job at applying makeup. I originally bought a brush cleaner from Zoë Ayla and it worked amazing so I thought id try their brushes. I love sparkly and glittery things so these brushes were PERFECT for what I wanted. The shipping was quick and the quality is great. Join the #zoeayla community on Instagram & Facebook!